Depending on a type of a heating emitter used in any room, in general terms, a heat could be distributed in two basic ways - radiation or convection. Radiation of a heat is defined as: the object having higher temperature (in such a case heating emitter-radiator) produces heat as an electromagnetic wave interfering any objects having lower temperatures (i.e. walls, furniture and other objects placed in a room) and those objects absorb and by this raise their temperature. The amount of heat emitted from the surface of the surface of a radiator is determined by its temperature and the shape and format of the casings. The higher surface temperature results better heat energy output. From the other angle the physical process of natural convection is based on the specific construction of heat exchanger – copper-aluminum coil is supplied by a heating medium (usually the low pressure hot water - LPHW). Heating medium being conveyed through the coil interferes with a cold air – warming it up. As the warm air has less density than the cold one, it is significantly lighter and goes up towards the ceiling of a room. Heated air being conveyed through the coil also results with the suction of any cold air by creating underpressure on the outer side of a coil. Convection heating emitters that are manufactured by Verano would emit a heat also using a forced convection, whereas a dynamic of airflow is increased by using nearly voiceless and energy efficient EC DC fan motors. Each and every heating system is based on either convection or radiation, whereas their participation in the amount of exchanging heat in a room varies. In convection heating a percentage convection share is near to 100%. 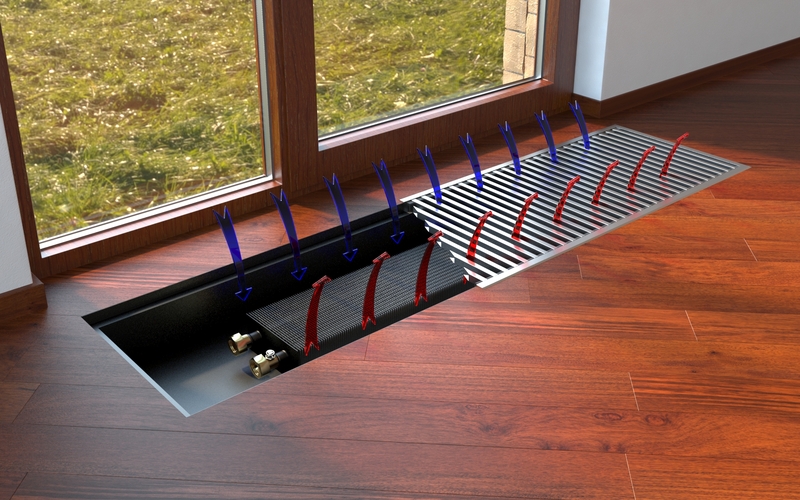 Due to the fact that the heat is transferred evenly through the convection, trench heating or LST wall suspended heaters from Verano guarantee equal, even and constant temperature distribution but also natural circulation of an air, that leads to more air/thermal comfort of residents and occupants of home or office building. A carbon dioxide (CO2) that is breathing away from men’s lungs is usually heavier than the air is, it’s been usually located at the bottom layers of any room and this is considered as a very negative factor when building occupants health is concerned with conjunction to people sleeping or doing any work by sitting at their desks for a long period of time. Natural convection is causing a natural air circulation and influence its homogenisation (ab. : eliminating layers of air that include high density of exhaled CO2).